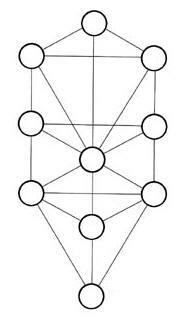 In my many years of esoteric studies, one of the best systems of knowledge I have encountered is the Cabalistic Tree of Life. This diagram contains ten circles representing the Sephiroth (singular: Sephirah); that is, “spheres,” “numbers,” or “emanations”. The Sephiroth are the numbers 1 through 10 considered in their archetypal sense. Each Sephirah is an archetypal idea. Also, the Sephiroth represent emanations from God and describe the process of creation. Traditionally the Kabbalists did not tell much about the different Sephiroth; usually giving only their name and a short description. This was done intentionally as they wanted to encourage students to experience the Tree of Life rather than just accepting intellectual ideas from others. The Tree of Life and the Sephiroth can be looked at and experienced from many different angles and different levels. Although created by Kabbalists the tree can be easily applied to other religions and esoteric teachings; it is that basic and fundamental. But first and for all, it is a blueprint of the human being, and everything on the Tree of Life is a reflection of what happens inside oneself. Therefore one should see, and experience, the Tree of Life inside oneself. The Sephiroth have each their own respective place on the Tree, and they relate to each other in particular ways, depending, for example, on the Paths that connect them. What I will give you here is the basic information based on my own studies and insight. The Kabbalah is not a rigid system and there is a lot of flexibility in its interpretation. The Kabbalah also attaches great importance to each letter and its numerical value, but that is a whole field (Gematria) which by itself we cannot go into here. As we mentioned before, the sephiroth are emanations from the divine. They are strongly defined by number and place on the Tree of Life. But what are they? According to Israel Regardie they are considered “to be substantial principles of power-vessels, or categorical ideas in which the consciousness of the universe expresses itself”. Sounds mind blowing, doesn’t it? They are like vessels or channels, in which and through which the divine powers can manifest themselves in their creative evolution. They are spheres of light, receptacles that hold particular energies as they stream down from the divine source. They are like different potencies emanating from the divine. They are constantly there, always active, never ceasing. They are a medium between the divine, the Absolute (Ain-Soph) and the physical world as we know it. They are characterized by limitation, measure, and concretization. They are gradations of powers, that is why they have different places on the Tree of Life. They are the substance of reality. They emanated from the divine, but are uncreated. The created universe that followed is just a reflection. The question arises, how did they come into being? Therefore we have to have a look at the Beginning. First there is Ain. Ain is Negativity, Nothingness, The Negative Existence, the Great Emptiness, The Absolute, The Absence of Things, The Prime Cause, The Originless Origin of all manifestation. You guessed it; it is not knowable, it is indescribable, everything we say about it, it is not. Then there is Ain Soph. Ain means ‘not’ and soph means “end”. Ain Soph is the Infinite, The Limitless, Infinite Space, Eternity. It is also called the Holy Old One, or the Old One of All Old Ones. Ain Soph is the primal darkness of the absolute unity above anything else. Ain Soph is the one in which everything has its origin, its existence,and to which everything returns. Next we have the Ain Soph Aur. Aur means light. The Ain Soph Aur is the Limitless or Infinite Light. 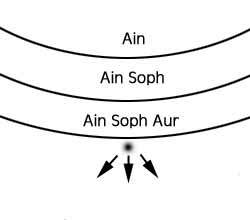 Now the Ain Soph Aur retracts itself within itself to a light point. Here we have substantiality out of nothing. This brings forth Kether (=the Crown), the first Sephira at the top of Tree of Life. Here is the primal vibration of the universe to follow. This light point starts to emit light energy, light rays. This is the primal ocean of subtle ether used for the building of the universe. This subtle ether is polarized into harmonious moving opposites of positive and negative, attraction and repulsion, contraction and expansion. There is harmonious equilibrium. 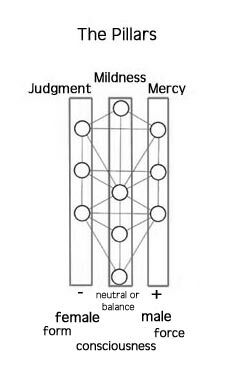 The negative energy creates the Severity (Judgment) pillar on the left side and the positive energy creates the Mercy pillar on the right side of the Tree of Life. And thus the next two Sephiroth arise: Chokmah (Wisdom) on the right side, and Binah (Understanding) on the left side. The left pillar is also called the Pillar of Form, the right pillar the Pillar of Force, and the middle pillar, the Pillar of Consciousness. Of the middle pillar it is said that it both shows how God reveals Himself to us (downward movement) and how it is our path for “conforming to His image” (upward movement). Ok, now we have three Sephiroth, and they form a trinity, called the Supernal triad. Under this trinity is the Abyss. Above the Abyss is the realm of ideas, or the Ideal. Under the Abyss, is the world of the real, or Reality and Causality, in which the next seven Sephiroth are to come. The next seven Sephiroth are the crystallization, the densification, of the subtle ether. Together they produce the universe, the world we know. To the right are all ten Sephiroth of the Tree of life with the columns superimposed. I am using here the traditional names of the Sephiroth. Their names don’t always reflect the meaning or content of them. It is not clear why the ancient kabbalists choose those titles. To know what the Sephiroth are about, one needs to read the explanation of each Sephirah. Kether is the first manifested Sephirah, the first condensation of the light of Ain-Soph. Kether means ‘the Crown’. It sits like a crown on the top of the Tree of Life, but at the same time is the Crown on top of our head. It is said that Kether encircles and covers the brain of the primordial Man, Adam Kadmon. One might compare it with the Crown Chakra of the yoga system. 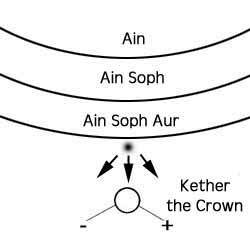 It is called the Crown because Kether belongs half to the human system (and the Tree of Life) and half to the Divine (or Ain-Soph), like a crown sits on top of the head, but is not quite part of the head itself. Kether connects the Divine and the human. Or, man lives in the universe but does not belong to the universe, but to the divine. Kether is man’s connection to the divine. That is why Kether is partly hidden, because of its connection to the Nothingness, and partly manifest because of its connection to the manifested universe. Kether is the source of light rising up from the darkness. It is a monad of pure energy in which all opposites are unified. In Kether is the blueprint of the entire universe. Kether is also called Mashabah, which is consciousness, as Kether is pure consciousness. In Kether resides the divine essence of a person, indestructible. Kether is also called the Crown because of its ability to receive and integrate the divine energy. For me, Kether means the very essence of my being, that divine monad that always has been and always will be. It is immortal, as it is part of the Divine, separated only in my present awareness. Being in Kether I truly can say, “I am the Divine”. Kether also represents my birth in this world and all the qualities I have been born with. Chochmah is the second Sephiroth. Chochmah means ‘wisdom’. It is the Word, the Logos. It is the Son in relation to Kether as its Father. Remember Chochmah is on top of the right, positive, male pillar, and thus Chochmah is considered to embody the primal male energies. It is the active, male principle, the vital, energizing element of existence. In Chochmah is the will to create. Chochmah is associated in the soul with the power of intuitive insight, flashing lightning-like across consciousness. In man Chochmah corresponds to the right brain hemisphere. It rules imagination and conceptual faculties. Chochmah also relates to the sense of sight. Chochmach is the power of selflessness that allows us to ‘taste’ divinity. For me, Chochmah is the driving fore in this life, the energy that keeps me alive and allows me to do the things I want to do. It is my will to live and to fulfill my purpose in life. It also represents the primal male energies in me that were established in my early years by the contact with my father. Binah (=Understanding) is the third Sephirah and sits on top of the left, negative, female pillar. It embodies the primal female energies. Binah and Chochmah form a harmonious relationship. She is the female that harbors the seed and brings forth the fruit. She is the Mother, the Great Sea, the primal substance filling the entire universe and the fundament of the universe. Binah is stability, it organizes, regulates and gives form to the energies of Chochmah. Binah calms the stimulating energies of Chochmah. While Chochmah is the seed, Binah nurtures the seed. Binah comprises the entire intellectual power of human consciousness. In the human thoughts, the intuitive formations of Chochmah come to fruition in Binah and become understandable and classifiable. Binah is associated in the soul with the power of conceptual analysis and reasoning, both inductive and deductive. The “understanding” of Binah also implies the ability to examine the degree of truth or falsehood inherent in a particular idea. For me, Binah is what shapes my life, giving form to the different processes I have to go through: education, relationships, environment, everything that has shaped and is still shaping my character. Binah also contains the primal female energies that were established in my early years by the contact with my mother. Chesed (=Mercy) is the first Sephirah created underneath the Abyss. Chesed is unlimited benevolence. Chesed arises by the outpouring of of the energy of the supernal triad across the Abyss in the world of causality. It contains a productive and vivifying energy. Chesed is the first of the seven lower Sephiroth that give form to the universe, and in this sense it is related to such concepts as laws, justice, generosity, protection, maintainer, aspects we associate with a king-ruler. Chesed is unlimited benevolence. Chesed is associated in the soul with the desire to embrace all of Creation and bestow upon it goodness. Chesed contains the oral esoteric teachings, the secret teachings, the hidden knowledge. For me, Chesed is my inner king-ruler, how I rule my life, how I manage my life. Am I helpful to those who need help? Am I just in my actions? Do I bring prosperity in my life and my environment? Do I give freely, or do I hold back too much? Geburah is the fifth Sephirah. It stands for power, strength and courage. As we saw in Chesed an outpouring of energy, in Geburah this energy is being controlled, contracted, limited. As a pair, their qualities provide an equilibrium between expansion and contraction. The contracting quality of Geburah allows for usefulness, activity, progress. It also decomposes that which is useless. Geburah is the king-warrior, who is well aware of the boundaries of his territory and will fiercely defend it. Discipline, severity, restriction are his nature. It is the restraining might of Geburah,which allows one to overcome his enemies, be they from without or from within (his evil inclination). Geburah contains the written teachings. For me, Geburah is the inner king-warrior. In life, I have to set up boundaries. I have to keep out unwanted energies and people. But the gates are open for people I welcome. Boundaries have also to with behavior. I do not want people to take advantage of me, and I have to be aware what the boundaries of other people are. Sometimes I have to be more assertive, or even aggressive, and go out and fight. Sometimes I have to defend my (psychological) territory. The sixth Sephirah, Tiphereth (=Beauty) is the center of the Tree of Life. It corresponds to heart of the human body, where the sense of ego lies. Being in the center of the Tree of Life nothing happens without its mediation. It coordinates and gives harmony and equilibrium to the inflowing forces. It reconciles and gives compassion. Tiphereth is also associated with sacrifice, since as we climb up the Tree of Life we have to sacrifice the ego at this place, before we can go any higher. Tiphereth is also about sincerity and the meaning of individuality. For me, Tiphereth is my sense of ego. The ego that has been nurtured by society, by family members, friends. They usually call it “character”. The ego is built during the first twenty years of one’s life, when there is no resistance against outside influences. Once adult, I started to analyze my ego and I got rid of some negative character traits,a difficult and long process that I am still working on. The seventh Sephirah is Nezach, Victory or triumph, victory without regret. Nezach is the place of the emotions, the feelings, the powers that stimulate creativity. Nezach contains what people usually understand by love, satisfaction, and art in all its forms. Nezach, As the divine energies flow down the Tree of Life, Nezach makes them practical for man. It allows man to crystallize his intentions and sweep away parasitical energies. For me, Nezach is my emotions, whether they are blocked, misdirected or free flowing; if my emotions are spontaneous or if they are learned habits because as a child I was programmed to react in a particular way. I try to cultivate higher emotions like enjoying music, and be aware of and restrict lower emotions, such as anger, when they are not constructive. The eight Sephirah is Hod, Glory. Being the opposite of Nezach, Hod controls the practical, emotional energies of Nezach by its mental powers. Hod is associated with the intellect and thoughts. Intellect and emotions need to balance each other. Expressing emotions without thinking is equivalent to uncontrolled rage. Thinking without emotions leads to becoming rigid. Hod gives stability, fixation and practical knowledge to the free flowing energies of Nezach. Hod by itself is very speculative and theoretical. Hod is associated in the soul with the power to continually advance, with the determination and perseverance born of deep inner commitment, toward the realization of one’s life goals. The acknowledgment of a supreme purpose in life, and the total submission of self which it inspires, serves to endow the source of one’s inspiration with an aura of splendor and majesty. For me, Hod is my thinking process, and my thinking structure. I try to be aware of my opinions; are they shaped by what I read or hear in the news, are they based on other people’s opinions? Does what I think really come from me, myself, or is it just a program put into my mind by others? The ninth Sephirah is Yesod, the Foundation. It is the foundation of the created world on which the other Sephirth rest. Yesod is usually seen as the lower astral world, the ether of electromagnetic substance well known in spiritualism and psychic phenomena. It is a subtle energy that vivifies, coordinates, integrates and stimulates the physical bodies. It is related to sexual energies and the sexual organs in the human body. Yesod has the qualities of imagination, illusions, and dreams, all of which are necessary to make things happen in the world when properly understood. It gives us the power to connect, communicate and contact with outer reality (which is the next Sephirah, Malkuth). 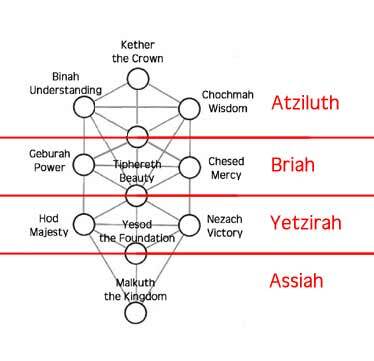 All higher energies of the first eight Sephiroth have to pass through Yesod when expressing themselves in the physical world (=the tenth Sephirah). Yesod guides, forms and structures those higher energies and shapes them into their final patterns when expressed in the physical world. In this sense Yesod is also the foundation of the physical world, as the physical world is just the physical expression, or formation of what has already been structured and formed in Yesod. Yesod is linked to the stream of blessings, or energies, that are flowing from the upper world to the physical world, for this Yesod is also called El Hai, the Living God, or El Shaddai, God the Provider. For me, Yesod represents my dreams. The dreams I never realized because my expectations were not based on reality, but also the dreams I did realize. Yesod is the fertile ground of imagination that helps me to come up with new ideas and to try out new things. The final and Tenth Sephiroth is Malkuth, the Kingdom. As last of the Sephiroth it is the synthesis of all other Sephiroth. Malkuth is the physical and total expression of the divine. It is the physical world as we daily experience it, the physical body, but also all crystallized energies that make this physical life possible. Malkuth gives us the power of self-expression. Malkuth is also called The Queen, the Daughter, Bride, or Gate. As Gate it is the gate through which one enters the Tree of Life. As Queen, Daughter or Bride she is the Shekinah, the female aspect of the divinity, in relation to Kether, the first Sephirah, who is the King, Father or Groom. It also shows that when ascending the Tree, one needs to join Bride and Groom, that is joining our ordinary consciousness with the divine consciousness. In Malkuth the Shekinah, or Divine presence, lies dormant. For Shekniah to rise up successfully, all six Sephiroth of what is called Zeïr Anpin (the Small Face) have to be purified, otherwise Shekinah will retreat back to Malkuth. For me, Malkuth is the way I express myself on the physical plane. It is that what I actually have realized, and what I am still working on. I can the result in the environment I have created. The kabbalists see the Ehieh-Shekinah as the undifferentiated primal cosmic force, a unity of opposites that is the cosmic consciousness of the divine, or Ain Soph. Although a unity, we human beings see it as two opposites. Ehieh-Shekinah is both inside ourselves and out there in the world. Ehieh is cosmic consciousness, and we regard it as the positive, male principle, static and transcendent. Shekinah is cosmic energy, and we regard it as the negative, female principle, kinetic and present in every day life. Shekinah can be in two states: active and passive. In her active state she is the creative movement that brought forth the cosmos. She is the driving force of all the manifestations in the universe. When coming down from the Ain Soph she created all the Sephiroth and rests in the last Sephira, Malkuth. This is her passive state. This means that Shekinah is passive on the physical level and lower levels of consciousness. Shekinah is also in rest in the physical body. But Shekinah can be awakened and made active. Then she will guide us up the Tree of life, to be united again with her partner or groom Ehieh. All this is very similar to Kundalini in the yoga and Tantra system. Adam Kadmon is Primal Man, the Heavenly Adam, the Original Man. In the strictest sense he is the emanation of the Divine in Atziluth (the World of Emanation, see below), but he also radiates in the other three Worlds. It is man as he originally was, and actually still is although he does not realize it anymore, because his consciousness has split. Part of him is still close to the Divine, while the other part is here on earth. That is why it is said that he has two faces. Arick Anpin, the Long Face or Long Countenance. It is composed of the three Supernals: Kether, Chochmah and Binah. It is the part of ourselves that experiences infinity, it is our immortal being. It is also called the superconscious power of will in man. Zeïr Anpin is the Small Face, or Small Countenance. 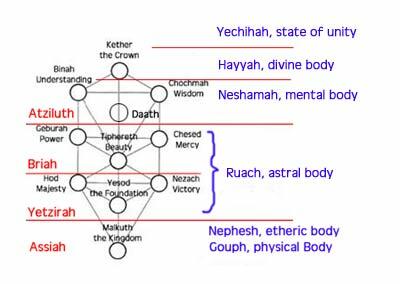 It is composed of the Sephiroth Yesod, Hod, Nezach, Tiphereth, Geburah and Chesed, and sometimes Daath, the hidden Sephiroth is included as well. Zeïr Anpin is seen as the emotive faculties of the soul. They form the personality of a person, those temporal qualities or psychological characteristics that make a unique person. They are temporal because they are the faculties we got at birth, we will shed them at death. Zeïr Anpin is finite as it belongs to the lesser worlds. It only has finite states of being. Zeïr Anpin is our mortal being. The Abyss and the Veil are two ‘obstacles’ to overcome when ascending the Tree of Life. There is that much information available and their position on the Tree varies with the writer. 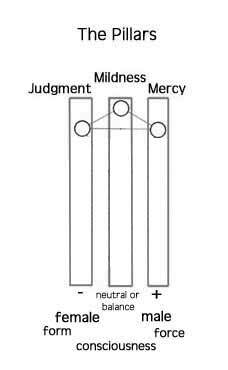 I find their position as shown here the most logical as both obstacles form a separation between the three triads. Kether, Chochmah and Binah form a trinity, the supernal triad, which resides above the Abyss. This Abyss cannot be traversed by man as long as he is bound by his world of intellect and everyday experiences. Only by riding the mercabah (=the wagon, vehicle) of mystical experience, with the resulting destruction of the sense of ego, will he be able to traverse the Abyss and contact the supernal triad. Under the second triad, formed by Chesed, Geburah and Tiphereth, is another barrier, called the Veil. The Veil shields our ordinary consciousness (below the Veil where the next four Sephirah are) from the deeper contents of our soul, above the Veil). The Veil is the same as the veil in the temple, the curtain that shields the mysteries from the profane. Only the initiated can pass the veil. It is also the veil or curtain behind the High Priestess in the Tarot. 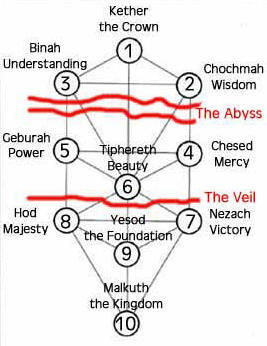 There is a lot of dispute about the Sephirah Daath which would be the Sephirah following Binah and situated on the middle pillar, and ‘above’ the Abyss. Some say it is not a Sephirah at all. Daath means Knowledge, in the first place knowledge of the Divine and the divine expression in the universe. Daath is also the total of knowledge gained by an individual throughout his life or lifetimes, and especially the knowledge about what (his) life is all about. Daath is also the key to the manifestation of all things. It is a Sephirah of becoming, as after Daath Creation will take place. It is said that Daath is the child of Binah and Chohmah, the Mother and the Father, not situated on the Tree of Life, but above. That is, Kether, Chochmah and Binah form the (flat) basis of a triangular pyramid (actually a tetrahedron) and Daath is at the top of this pyramid, above the flat plane of the Tree. Why the ancients saw it this way, we don’t know. Maybe they wanted to express a particular insight. 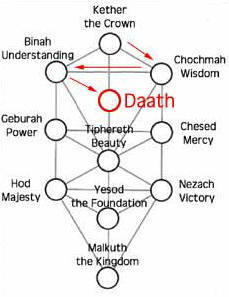 I think one can easily fit Daath in the regular Tree of Life as fourth Sephirah. Ascending the Tree of Life on the middle pillar, passing Tiphereth, we leave the ego behind and cross the Abyss. Daath is seen as entering the mysterious blackness. This void or emptiness receives of and ultimately leads to the Brilliance of the White Light of Kether. The void or emptiness should not be seen as a negative, awful place, but as the underlying nature of all things and beings as explained by Buddhism and especially by Dzogchen. Only by passing through the Abyss can we realize out innermost spiritual nature. In the human body Daath is situated between the two brain hemispheres, and thus sometimes said to be between the eyes. The Kabbalah knows four Worlds. Although they exist simultaneously, one flows forth from the other. The Tree of Life exists in each of the four Worlds, and at the same time it has four divisions structurally corresponding to each of the four Worlds. First, let us have a look at what those four Worlds are. Atziluth is the World of Emanation. It is the first world that emanated from the Divine. Emanation means that it flowed forth from the Divine. It is not the same as creation. Creation implies an act of creating, that will take place in the next World. Atziluth is the World of Primal Concepts, Emanations, Radiations. It contains the unlimited divine energy in the form of primal archetypes. Here the Divine is present and is active. Here is the divine essence of all things and beings, the primal will, and pure consciousness. It is the eternal unchanging world. It is the world of unity. In this world the will to create is born. Here are the seeds, the essence, of all the worlds to follow. In man Atziluth brings forth thoughts and concepts, and the will. Atziluth corresponds to the element of Fire, the element that transforms everything into its essence. Ehieh and Shekinah, the two poles of our consciousness unite in Atziluth. Briah is the World of Creation. The ideas, the concepts that arise in Atziluth now are being clothed with subtle substance. This is the act of creation. In Atziluth the Divine itself is present and ‘acts’. In Briah the Divine works through the archangels who condense the archetypes and prepare them for further creation work by lower order beings. Leaving the divine world of Atziluth, in Briah duality arises, space-time, male-female and so on. In man Briah corresponds to the Spirit. In Atziluth we had non-being, in Briah we get the sense of being. The condensation of energy in Briah makes this world correspond to the element of Air. Yetzirah is the World of Form. It is the world of procreation and movement, of development. Here the Divine works through the Angels. The Angels give form to the energies of Briah. They each specialize in one particular aspect of the creation work. In man Yetzirah correponds to the Heart. Further condensation of the energies makes Yetzirah correspond to the element of Water. Assiah is the World of Action. It is the world of happenings, appearances, phenomena, the world of becoming. It is our physical world, crystallized to a state of solidity, making Assiah correspond the element of Earth. With the term ‘physical world’ we also understand the spiritual energies pertaining to the laws of nature. In Assiah one expresses oneself as an individual being with a self consciousness. In the human body Assiah corresponds to the physical body. The Four Worlds relate to the Tree of Life in different ways. They are all equaly valid and the different system are just different ways to look at the same thing, like a diamond that shows different colors under different angles of view. 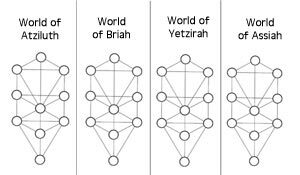 One way to look at it is by saying that the Tree of Life exists in each World, thus we have four Trees, an Atziluth tree, a Briah tree… Thus we have, for example, a Tipheret Sephirah in each of the four worlds, each having different qualities according to the World it is in. Another way is that the ends of the Tree of life overlap when crossing a World. 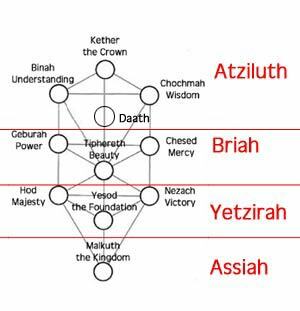 Malkuth of Atziluth becomes Kether of Briah; Malkuth of Briah becomes Kether of Yetzirah; and Malkuth of Yetzirah becomes Kether of Assiah. Then one can look at a single Tree of Life and see the four Worlds correspond to different levels of the Tree. When we accept Daath as part of the Tree of Life, then Daath is part of the World of Atziluth, as Daath is situated above the Abyss, some say across the Abyss. Daath is not part of the creation process that takes place on Briah. Kether is a connection point to the divine, and is usually not counted as a Sephirah when Daath is included. As the Crown, Kether sits both upon man’s head and the Tree of Life but is not actually part of either. The triads are always regarded as important structures in the Tree of Life. On each level they represent the polar opposites of energies on that level plus the resulting equilibrium. 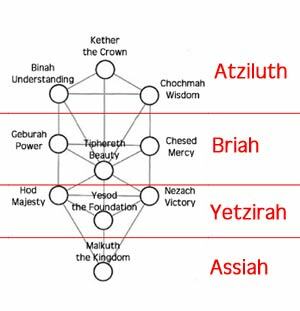 Leaving Kether out as part of any triad we find Atzliuth, Briah and Yetzirah are complete, but then the problem with the traditional tree is that in the potential triad of Assiah, Malkuth stands alone, with the corresponding pair of opposites not shown. It could be this way: the boundary lines between the four Worlds run through or are placed at Daath, Tiphereth and Yesod, with these three Sephiroth functioning as transformation stations between the Worlds. It is said that Daath is astride the Abyss. In Tiphereth the transformation from the ego to selflessness happens. Tiphereth is also where the old king dies (Osiris, or Christ on the cross) to be reborn in Geburah (as Horus, or the resurrected Christ). Yesod is where the transformation happens of an animalistic consciousness to a human consciousness. Gouph is the physical and densest body, created to be able to work and evolve on the physical plane. Nephesh is the “animal soul” that vivifies Gouph, the physical body. Nephesh can be seen as what is known as the etheric body. Nephesh collects the energies of sun and moon, and transforms them into different kinds of useable energies for the physical body. So, Nephesh is actually a body composed out of energy flows. Nephesh is the carrier of all passions, instincts and lusts. On this level man is only conscious of his own needs. Ruah is called “the human soul”, the spirit, the intellect. It is the breath of life which drives the emotions. It corresponds with the astral body. Ruah provides for the warmth of life, the desire for a sensual existence. It also wants to be a ego, but the ego is a construct. People with low developed consciousness have a very dense ruah body and will have lower astral or lower emotional tendencies. Man must stop to identify himself with his personality, or ego, and liberate himself from the lower emotional, and also animal, passions. By purifying himself, man will discover that ruah also has moral virtues, and knowledge to distinguish between good and bad. Hayyah is the pure existence of the individuality. It is not really a body but a state of being. It is the state of consciousness where one has a notion of being an essential being with a sense of “I”. Here one experiences or is aware of the Divine continuously creating the World. Yechidah, “the Only One”, is being One in the one. There is no sense of an “I”. It comprises the unlimited, transcendental idea of the Absolute.